Welcome to Our World …. “CHAOS” bellowed the night turn skipper down the phone at me ….. OK he didn’t, I made that up for dramatic effect. We weren’t working with our usual Sergeant tonight – he’d been called to Crown Court along with two others off our shift that day so we were blessed with the guest appearance of Sergeant I’m So Important, a DS who’d been kicked out onto the streets to ‘get some experience’ for his forthcoming Inspector’s board. “You working out of Littleville nick tonight Chaos ?” he said. “Well clearly yes as you’ve just rung Littleville police station and I just answered the phone” I replied. OK I didn’t say that, but it’s what I was thinking !!! I tell you, with the observation skills this guy has got you can see why he’s a detective !!!! “There’s good news and there’s bad news Chaos” quips Sgt ISI. “Oh really, there’s a new one” says I trying to sound surprised. “Afraid you’re on your own tonight, only got a double crew over here as well so you’ll have to keep it under control yourself over there. Already had a go at your Inspector, letting so many of your shift have leave at the same time”. I don’t know if that is what was said, but I’d like to think it was. It’s A Joke …… Not ! aka It’s the way I tell ’em ….. Very commendable attitude you may think …. and being the ever astute and helpful sort of bobby I am I get straight on the phone to Immigration or Border Agency or whatever they are calling themselves this morning. “Tell him to come to Liverpool, we’ll sort him there” the ever unhelpful voice at the other end of the line says – I’m sure many of you dear readers have experienced this before but I shall continue …..
Actually, when the chap presented himself at our Front Counter, the extent of his English was “Me illegal” and to hold his hands out in front of him ready to be cuffed – I extended the conversation above for means of clarity lol. Anyway, “Erm” I say to the disinterested voice on the other end of the phone “Actually I don’t think he could say Solihull never mind find it”. “Oh well, if you have to, lock him up and we’ll have to get over later”. Gee thanks, I think to myself, sorry to be such a burden to you guys. “What’s his details” says the voice, “I’ll run him through”. No sooner had I passed the required information the voice piped up “Oh Barry, he does this every year”. “Who’s Barry ?” I say quizzickly. “Your man” says the voice “We call him Barry, does this every year, so does most his family. They come over on a visa alledgedly to have a holiday with family but they never go back on time. They work in the restaurant then when they decide to go home they turn up at a police station somewhere and hand themselves in. The rest of ‘um are probably at a different nick right now, no doubt we’ll have a round trip picking them all up. Free flight home isn’t it”. Now, I’ve been in the job long enough to be able to say I’ve heard it all before but this one did stump me for a moment. 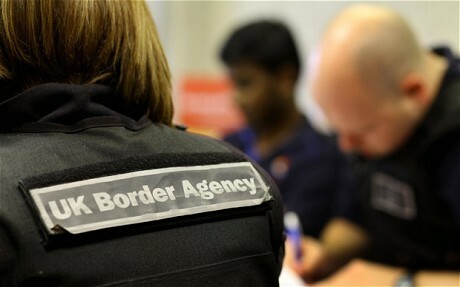 “So why do we keep letting them back in ?” I managed to mumble out – actually (hopefully) that was all that Mr Officialdom on the other end could hear because the names I was calling him and his colleagues under my breath aren’t publishable on here dear reader.